A sixteenth-century map of the New Word that shows an ice-free Antarctica? The map drawn by Piri Re‘is dated to the month of Muharrem 919 AH (corresponding to spring 1513 CE) is well known in the fringe literature. Piri Re‘is was an admiral of the Turkish navy and this map, showing the Atlantic Ocean, West Africa, the Iberian Peninsula and lands on the western side of the Ocean, seems to have been based on twenty different maps. One of them has been thought to be a copy of the lost map made by Christopher Columbus, as Piri’s own annotations claim as much. The map was rediscovered by the Director of National Museums, Halil Etem Edhem (1861-1938), when the Topkapi Serail Palace in Istanbul was being converted into a museum in 1929. The map was subsequently studied by a prominent German orientalist, Paul Kalhe (1875-1964), who reported on it at the eighteenth Congress of Oriental Studies in Leiden in 1931. It was drawn on camel skin parchment, using nine different colours of ink; it is 860 mm tall, 610 mm wide at the top (north) and 410 mm wide at the base (south). There is evidence along the top edge that another strip of parchment, which would probably have shown the British Isles, Iceland, Greenland and Newfoundland, has been lost. The eastern section of the map has also been torn away, leaving a ragged edge, although the change in width from north to south is a product of the natural shape of the skin. It is illustrated with a number of ships, most of which are Portuguese caravels, parrots (referred to as ‘tuti birds’, depicted on the island of Antilles) and mythical images. 117 place-names are shown on the map, most of which are typical of late medieval portolan charts and are easily identifiable. Portolans developed in the late Middle Ages as mariners’ charts of the Mediterranean Sea and the Atlantic coasts of Europe, based on the use of the magnetic compass and dead reckoning to calculate longitude. As the European nations began to explore the rest of the world, so the newly acquired information was added to these types of map. Like other portolans, the surviving part of Piri Re‘is’s 1513 map has a network of lines radiating from five circular patterns of wind or compass roses; these so-called rhumb lines show various compass directions and prevailing winds. A typical feature of this sort of map is the depiction of the recently discovered New World at a larger scale than the Old World. The effect of this is to displace many coastal features farther north and south than their correct latitudes. The number of compass roses is evidence that the original map depicted the whole world as the standard portolan chart has seventeen such roses. The remaining twelve would have been on the now lost sections. There are also thirty legends around the map, twenty-nine in Turkish and one in Arabic, the latter identifying the mapmaker and dating it. The Turkish legends give details about the people, animals, minerals and curiosities of the New World. 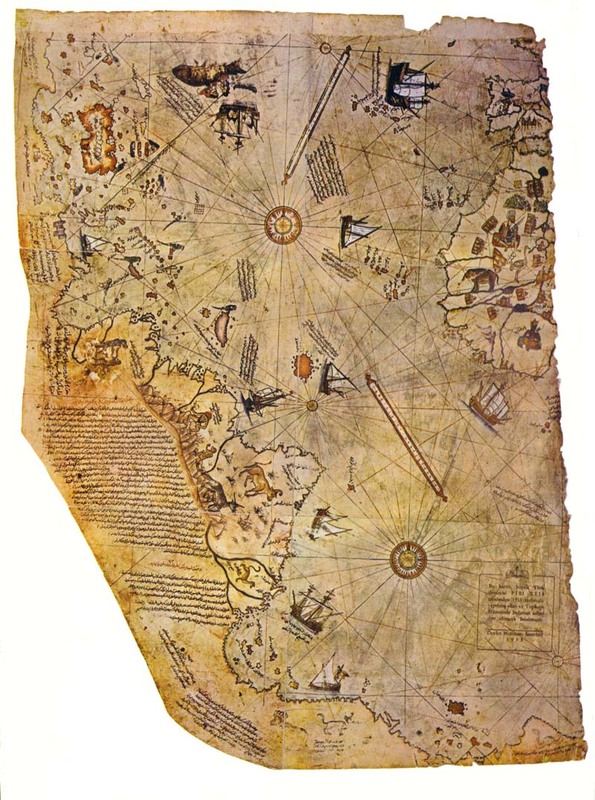 In the Turkish legend detailing his sources, written over South America, Piri states “This section describes the way in which this map was executed. No such map existed in our time. Your humble servant is its author and brought it into being. It is based mainly on twenty charts and mappae mundi, one of which was drawn in the time of Alexander the Great, and is known to the Arabs as Caferiye. This map is the result of comparison with eight such Caferiye maps, one Arab map of India and China and also the map of the western land drawn by Columbus; such that this map of the seven seas is as accurate and reliable as the latter map of this region.” In his own words – which most Bad Archaeologists do not quote – Piri specifically denies that it is a copy of an ancient map and states that it is his own composition and, moreover, by claiming Columbus as the source for the map of the ‘western land’ (i.e. the Americas), he clearly implies that it was not present on the ancient Caferiye maps. Only Hapgood and his followers see value in this statement: Hapgood believed that Piri had miscombined several separate maps of South America and Antarctica. Only this way could he explain why Piri’s map is not an accurate depiction of these continents. On the map, the shape and orientation of Hispaniola is similar to the depiction of Cipango (Japan) on portolans; it was one of the places Columbus had hoped to reach on his first voyage. Indeed, when he discovered Hispaniola during his first voyage, he believed that he had reached Cipango. Cuba is also shown as part of the mainland, as Columbus believed that it was a great cape projecting east from Asia (indeed, Columbus would have been astonished to learn that he had discovered a new continent, believing until his dying day that ‘New Spain’ was part of Asia). The placenames recorded by Piri on this section of the mainland derive from Columbus’s second voyage and clearly identify the land as Cuba. These points demonstrate the map’s close connection with Christopher Columbus, supporting Piri’s statement that he copied a map by him. Fringe writers tend to say little about Piri, beyond his authorship of this particular map. However, he is a well known character in Turkish history and important in the history of cartography (although not for the reasons preferred by Bad Archaeologists!). 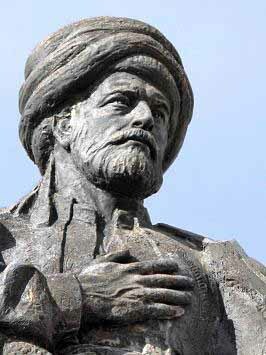 Born Muhyi-iddin Piri ibn Haji Mehmed around 1465×70, probably in Gallipoli in modern Turkey, he was the son of Hadj Mehmet. He was also a nephew of Kemal Re‘is (c 1450-1510), who served as naval commander of the small fleet at Egriboz before embarking on a career of piracy with Burak and Kara Hasan (died 1521). Joining him as a young man, Piri fought the Spanish, Genoese, Venetians and other enemies of the Ottomans. Until 1492, they attacked shipping in the western Mediterranean, using the island of Jerba as their base. At that time, the Moors of Granada were in retreat during the latter stages of the Reconquista, and Kemal Re‘is assisted in the evacuation of Moslem refugees from Spain to North Africa, as well as fighting against the Spanish. Kemal and Piri were invited by Sultan Beyazid II (0000-1512, Sultan from 1481) to re-enter the service of Ottoman navy, both with the rank of re‘is (admiral). They served in the battles of Lepanto, Methoni, Koroni, Mitylene and Rhodes. Safai described the heroism of Piri during the battle to capture the fortress of Methoni in 1500 in his poem Fetihname-i Inebahti ve Moton. After the death of his uncle in 1510, Piri returned to Gallipoli, where he drew the first of his two world maps in 1513, part of which is the now famous map. He presented it to Sultan Selim I the Conqueror (died 1520, sultan from 1512) in 1517, following service as admiral in the Sultan’s Egyptian campaign. He also accompanied his cousin Muhiddin Re‘is, one of Barbaros Hayreddin Pasha’s (1466-1546) captains, on further campaigns in the Mediterranean around this time. Throughout his career, he continued to make his own maps of the places he visited as well as collecting the charts of other mariners; he was aided by his knowledge of numerous foreign languages, including Spanish, Portuguese, Italian and Greek. In 1521, he brought this information together in a book Kitab-i Bahriye (‘Book of the Sea’), a text of sailing directions divided into regional chapters, which was more detailed than his earlier world map and contained some 210 maps; unfortunately, none of the surviving versions seems to be from Piri’s own hand. The poet Muradi described Piri as Kethüda, indicating that he served as steward of the shipyard. In 1524, he was appointed pilot to an Ottoman fleet under Grand Vizir Damat Ibrahim Pasha, sent by Sultan Süleyman Kanuni (The Magnificent, 1494-1566, sultan from 1520) to quell the rebellion of Hain Ahmed Pasha (Viceroy of Egypt 1523-4). Following this voyage, he rewrote Kitab-i Bahriye and presented it to Süleyman in 1526; he later presented him with a second world map, made in 1528, based upon different and more up to date sources than the 1513 map. By chance, the only surviving part of this map is part of the depiction of the Atlantic Ocean. Piri Re‘is’s final period of active service with the Ottoman navy was as Commander of the Fleet in Egypt. He fought the Portuguese off Yemen and captured Aden in 1547, taking Muscat in a second expedition in 1552; by then, he was in his eighties. He then laid siege to the Portuguese fortress at Hormuz, which controlled entry to the Persian Gulf, but lifted it after being warned that a superior fleet was coming to its aid. Having left the fleet in Basra for repairs, he took three ships to Suez, reaching the port with the loss of one ship in 1553. When he reached Egypt, he was imprisoned and condemned to death for allegedly fleeing the battle to save himself and his treasure, the accumulated spoils of his pirating days with Kemal Re‘is and his later naval service. The accusation is believed to have been a fabrication by Kubat Pasha (Governor of Basra), whose enmity he had aroused by refusing to cede a share of the spoils of war; Kubat Pasha’s accusations were confirmed by the new Viceroy of Egypt, Dukaginzade Mehmet Pasha, for political reasons, and Piri was executed in 1554, aged more than 80. His confiscated treasures were taken to the Topkapi Serai Palace in Istanbul. The suggestion that the Antarctic continent is represented on the map was first proposed by retired Captain Arlington Humphrey Mallery (1877-1968) in 1956. He was an amateur archaeologist who believed that North America had been extensively colonised by Celts, Vikings and other Old World peoples, who possessed accurate maps lost to later ages. Tellingly, Mallery used the word ‘decipher’ to describe how he analysed and reconstructed what he believed the sixteenth- to eighteenth-century maps depicted. He thought that a combination of numerous maps was used to produce a single map, but that the later copyists did not recognise that their sources had different points of origin, different scales and different projections. It was therefore necessary to rearrange different parts of a single map to understand what the hypothesised originals had shown. Bizarrely, Mallery managed to influence a few other people, including several officers of the US Navy Hydrographic Office, who came forward to endorse his reconstructions. He also made a powerful impression on Charles Hapgood (1904-1982), a history of science teacher who read a transcript of a radio broadcast on Mallery’s interpretation of the Piri Re‘is map. Hapgood had developed the hypothesis of what he called earth crustal displacement during the 1950s. According to this hypothesis, the earth’s crust is poorly bonded to the underlying mantle and occasionally slips over it, causing worldwide devastation. One of the causes of these displacements is the build up of ice at the poles, which causes the crust to become top-heavy and move towards the equator through centrifugal force. Correspondence with Albert Einstein (1879-1955) impressed the theoretical physicist so much that he wrote a foreword to Hapgood’s 1958 book Earth’s Shifting Crust. Hapgood was the first to draw wider public attention to maps, including the three discussed on this site, that he claimed showed Antarctica over three centuries before its accepted discovery in the nineteenth century. Based on aerial photographs taken by the US Air Force, Hapgood compared Piri’s map with an azimuthal equidistant projection of the world centred near Cairo. Hapgood assumed that the original source maps, which he believed derived from an ancient survey of Antarctica at a time when it was free from ice, were extremely accurate. Because of this, he also assumed that any difference between the Piri Re‘is map and modern maps were the result of copying errors made by Piri. Starting from this position, it mattered little to Hapgood if he adjusted the scales between stretches of coastline, redrew ‘missing’ sections of coastline and altered the orientation of landmasses to ‘correct errors’ on Piri’s map to match the hypothesised source maps, a technique derived from Mallery. Hapgood found it necessary to redraw the map using four separate grids, two of which are parallel, but offset by a few degrees and drawn on different scales; a third has to be turned clockwise nearly 79 degrees from these two, while the fourth is turned counterclockwise almost 40 degrees and drawn on about half the scale of the main grid. Using this method, Hapgood identified five separate equators. To make matters worse, it is necessary to ignore the placenames that fill the map. The placenames given by Piri match those found on other maps from the early sixteenth century, many of which continue to be used to the present day. In the 1960s, Hapgood’s ideas, which had not attracted much attention when first published as his arguments were complex and his results unorthodox, were popularised by a number of writers, including (most influentially) Erich von Däniken. He simply repeated Hapgood’s assertion that Piri’s map depicts an ice-free Antarctica as if a proven fact and suggested that the only explanation is that it must have been made by extraterrestrials, either at an early date when Antarctica was indeed free from ice or because their technology revealed the underlying surface. These accurate maps were later copied by Piri, via numerous intermediate copies, which introduced errors, inaccuracies and uncertainties. To von Däniken, moreover, the supposed elongation of South America was a result not of the combination of four separate maps at different scales, but of the map’s origin in satellite photography. The placenames written on the southern landmass demonstrate that Piri took into account the commonly held belief in a southern continent. Classical Greek geographers first posited its existence, and it was reported by Portuguese explorers voyaging along the east coast of South America (some of whom may have reached the Antarctic Peninsula). Even so, the shape of the southern land piri drew in no way resembles the coast of Antarctica, ice-free or otherwise. The sole point of comparison is that both lie to the south of the Atlantic Ocean and have a generally east-west coastline. An illustration of the power of the belief in an unknown southern continent is shown by the justification for depicting one given by Gerhard Kremer (Gerhardus Mercator, 1512-1594). On his map of the world published in 1569, he wrote that if the earth were to remain in equilibrium, the land masses of the northern hemisphere must be balanced “under the Antarctic Pole [by] a continent so great that with the southern parts of Asia, and the new India or America, [it] should be a weight equal to the other lands.” Deriving as it did from Classical geographers, this viewpoint explains why so many sixteenth-century cartographers were confident enough to show a southern landmass, even without evidence for its existence from mariners. All in all, the Piri Re‘is map of 1513 is easily explained. It shows no unknown lands, least of all Antarctica, and contained errors (such as Columbus’s belief that Cuba was an Asian peninsula) that ought not to have been present if it derived from extremely accurate ancient originals. It also conforms to the prevalent geographical theories of the early sixteenth century, including ideas about the necessity of balancing landmasses in the north with others in the south to prevent the earth from tipping over (just as Hapgood later hypothesised with his crustal displacement theory). Nevertheless, the map was a remarkable achievement, testimony to the skills of Piri as a cartographer and the only surviving representative of the maps made by Columbus during his first two voyages of discovery. As with so much in Bad Archaeology, it is only made mysterious by the wilful ignoring of evidence that explains its methods of composition (most importantly, the legends written by the mapmaker himself) and by making exaggerated claims about its accuracy while its manifest inaccuracy is overlooked. What about the Olmec sculptures? Don’t call me a racist, but I think it´s clear they belong to the African Race. The Olmec culture existed from about 1200 BCE to 400 BCE, whenever they were made, it would be just a couple years before Colombus discovered America, wouldn’t it? To me, the Olmec sculptures appear to be stylised depictions of native Americans. The resemblance to Africans I feel is very tenuous. Also we must not forget that in all stylised art, realistic depiction of the human figure (as in classical Greece) is almost always absent, hence the squat, stubby appearance of these sculptures. 1400 BCE is a completely different date than 1400 CE. The BCE means generally before the birth of Christ. So it wouldn’t be a couple of years before Columbus discovered America, but rather a couple of millennia. HAHA marisa you haven’t seen one of my compatriots face to face.. I find your assessments honest and reliable. There is to much sensationalist archeology based on making the facts fit the theory. It is refreshing to read your articles. So I must confess, I’m still a bit unclear as to the consensus interpretation of Piri’s southern coastline in this map. Are we to understand that it is the hypothetical coastline of this hypothetical southern landmass believed to exist by sixteenth century cartographers, which Piri felt obliged to include for completeness? Or is it just an inaccurate continuation of the South American coastline, rendered east-west either due to inaccuracies of contemporary navigational methods or due to idiosyncrasies of the particular projection method used? Piri reis doesn’t seem legit, he needs to hang around in Europe for a while to get his facts right. Do I detect bit of cultural chauvinism in your comment? Argument is weak.You can’t cherry pick which part of map is real and which one is illusion.More I will hold on unknown to stay than to speculate with possible answers specially when they are based on non consistency in accepting scientific data from single source .Your argument is not valid but possible in same way Antarctic argument is not valid but possible.Real answers need valid and possible argumentations. The map is labelled. The labels name places that can be identified and describe Piri’s sources. That is not cherry-picking. That is reality. I’ve blogged about it. I agree with you completely…..so refreshing to read a sensible article with no tiresome fringe idiocy.